California’s Bureau of Cannabis Control is actively working to develop regulations for the licensing of commercial marijuana businesses in the state. Its latest rules dictate, among other things, how cannabis can (and can't) be transported. Unfortunately for technology advocates, acceptable methods of transportation aren’t as forward-looking as the laws that govern usage. The Bureau outlines in its proposed program description that cannabis goods will be required to be transported inside commercial vehicles or trailers. Specifically, transportation may not be done by aircraft, watercraft, rail, drones, human-powered vehicles or unmanned vehicles. What's more, deliveries can only be made in person "by enclosed motor vehicle" and may not be visible to the public. Cannabis goods may not be left in an unattended motor vehicle unless the vehicle has an active alarm system. Furthermore, vehicles used for delivery must have a dedicated, active GPS device that enables the dispensary to identify the geographic location of the vehicle during delivery. 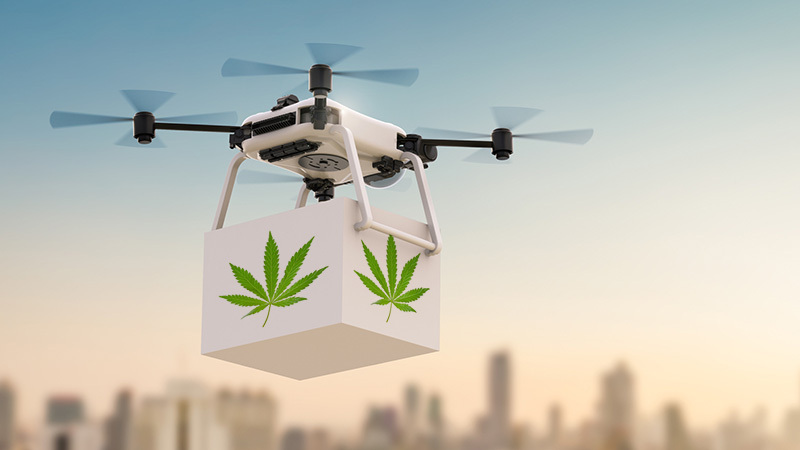 As Ars Technica highlights, the new rules will hamper a handful of start-ups including Trees Delivery, Eaze and others that have vowed to deliver marijuana via drone. The development isn’t all that surprising. Drone delivery in general is still a very new concept and one that’s ripe with federal regulation. Most drones must be operated within a pilot’s line-of-sight, a requirement that has kept retailers like Amazon and Walmart from full utilizing drones for widespread consumer deliveries. That’s not to say, however, that companies aren’t experimenting with drones. Domino’s in November 2016 delivered its first pizza using an aerial drone. UPS pulled a similar stunt a few months later. Best way to ensure people leave drones alone as they fly over their head is to put a big image of what's inside, on the outside of the box. No higher high in the sky .... oh my! Oh wow man....what's the Fabulous Furry Freak brothers gonna do? I'm surprised they included "human-powered vehicles" in the ban list. California seems like exactly the kind of place that would promote bicycle delivery, especially for stoners! That is exactly why they banned it. Look at nearly every single state that as Marijuana laws in 2016. Nearly all of them are trying to still curb its usage as much as possible through bureaucratic means that don't violate the wording of the vote, but still serve to dampen the industry.